No one shows you the ugly side of Alaska the way Stan Jones does in his somber novels about Nathan Active, an Eskimo state trooper posted back to Chukchi, his native village in the Arctic Circle. That rare thing, a deftly plotted mystery that's also an irresistible love story. With it, Jones's Alaska series (Shaman Pass, 2003, etc.) takes a quantum leap forward. This third book in Jones's Alaskan series (White Sky, Black Ice; Shaman Pass) does not disappoint. The investigation turns Active's life upside down and reshuffles his beliefs. Frozen Sun is, like the first two Nathan Active stories, a subtle, vivid, and effective crime novel that deserves a wide readership. Early on, Jones offers this dead-on description of spring breakup: “The vanishing snow drifts were disclosing a winter’s worth of dog droppings, caribou bones, discarded trash bags, lost mittens, cigarette packs, and crumpled beer cans. He (Active) passed two ravens at work on the rear half of a tortoiseshell cat, the head and forelegs still frozen into a rotting snow bank.” Ah, the beauty of the Alaska we all know and love.And some Goodreads comments:As a mystery, the book is very weak, but is an interesting study of the psychology of character development. The plot of this book generates little suspense so it's not exactly a page-turner, but the setting and characters are so interesting and unusual that it kept me reading avidly to the end. Jones does a great job giving us a sense of the environment and the story line carries along easily. Overall, another solid entry in the series. The setting and atmosphere are so immersive and wonderful that I will forgive a lot.I took Frozen Sun as more of a character study than a mystery. And more of a journey than a destination. I knew Nathan's obsession with Grace wasn't going to end well for his girlfriend Lucy, but I was curious how he'd get there. And a semi-happy ending sealed the deal. If Nathan's situation had stayed the same, the story might have been disappointing. The promise of change helped make it work. 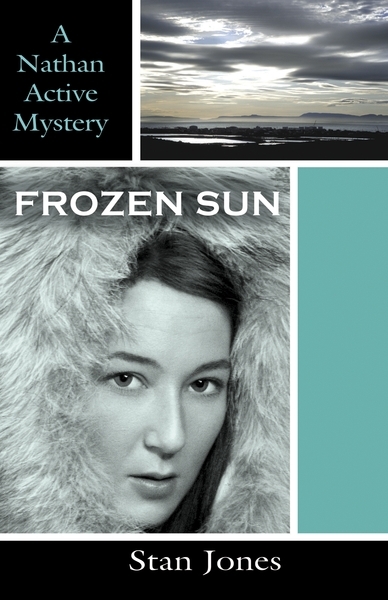 I liked Frozen Sun more than the Kate Shugak mystery I read. These books cover the same ground--"blizzards, tundra, Eskimos, bush pilots, and bingo-loving grandmas"--but the Shugak book spent too much time going on about the land and its people. Frozen Sun hit the sweet spot in terms of detail. Since the series is supposedly improving, I'll give the fourth book a shot. Rob's rating: 8.5 of 10.